A quick hello from London! ﻿Since I am rushing around, I thought I'd share a couple of pictures from my home I took last week. Here are two snap shots from my bathroom. I've always loved art in the bathroom there's something so decedant about it. As bathroom's get a bit steamy I didn't want to ruin one of my favourite original prints so I took a photocopy of the original and hung it in a frame. Conniving or clever? I like to think the latter! In case you're wondering, the shower curtain is Marimekko and the little bird mirror is from Graham and Green. What do you think about art in the bathroom - do or don't? I know I've just shown my dining room, but I love this picture as my little four year chose the pink roses at the local flower market in Malmö and they made me smile all week. Note: The cushions in the nook are Designers Guild. Are you more fresh flowers or autumn leaves at this time of the year? Love those curtains, and yes to art (or copies of) in the bathroom. Your roses are making me smile too at the memory of shopping for flowers in the same market when studying in Sweden - happy time! yes to art in the bathrom, mind you we dont have any in ours, enjoy London, think you maybe blown from A to B! Love your bathroom, so bright and those lights in your dinning are fantastic!! Hi Niki! thanks for sharing! Everything is so curated, functional and elegant at the same time. The appartment looks so warm and airy.... I love that intimate nook in your living. i have seen you share awesome pic and info on your blog.I loved it. I love that shower curtain! I've been wanting to put a framed photo in the bathroom, but I wonder about the condensation too. Seeing this has made me think how great it would look. We have original ad prints from the 40's framed in our bathroom. Art in the bathroom - YES! Of course Martina, it would be an honour to be featured on your blog. Thank you! 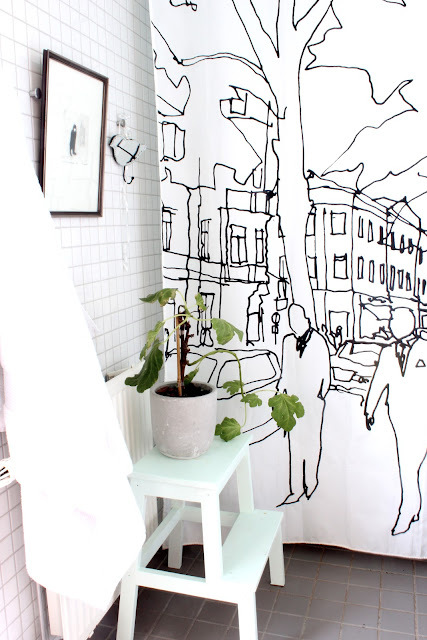 Thanks for your blog...keep on your updates.i love your shower curtain..
Hi Niki, Definitely art in the bathroom! I love that piece, do you mind me asking who the artist is? Ah okay, well it is a beautiful piece! Thanks Niki! I love your blog and I love this bathroom. Could you kindly share the details of the floor and wall tiles? (size and materials). Many thanks!